I still think white shabby chic furniture distressed is in style. 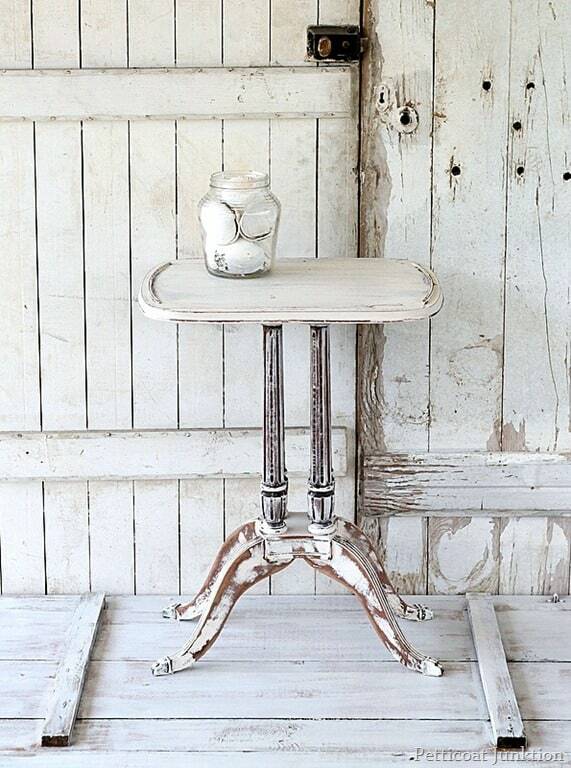 A pretty wood finish showcased by distressed white paint is perfection. I’m trending white décor. Too bad I would have to change everything in my house to get the look I’m dreaming of. Maybe one piece at a time. What a pretty table….right? Except it has a lot of missing veneer on the table top. So I decided on paint. Surprise!! I purchased this table when I went shopping with my friend Beth. 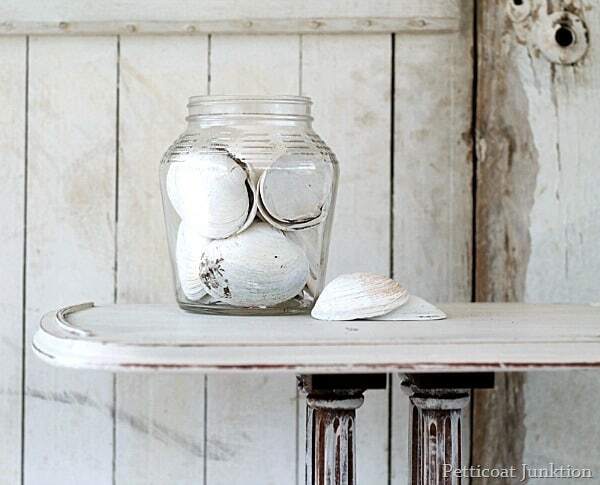 We shop flea markets and junk shops for thrifty finds. No new stuff for us. It’s always fun to have a girls day too. We talked and shopped and talked and shopped. I used Beyond Paint in Off-White for the finish. Not too white and not too tan. The paint is a three in one product. No priming, sanding, or sealing! We gathered the large sea shells on our trip to Kodiak Island to visit our daughter and her family. I did a little distressing by hand where the veneer was missing on the top. Sometimes it’s easier to distress by hand instead of pulling out the electric sander. I have more control when sanding by hand. It takes longer but the finished look is worth it. 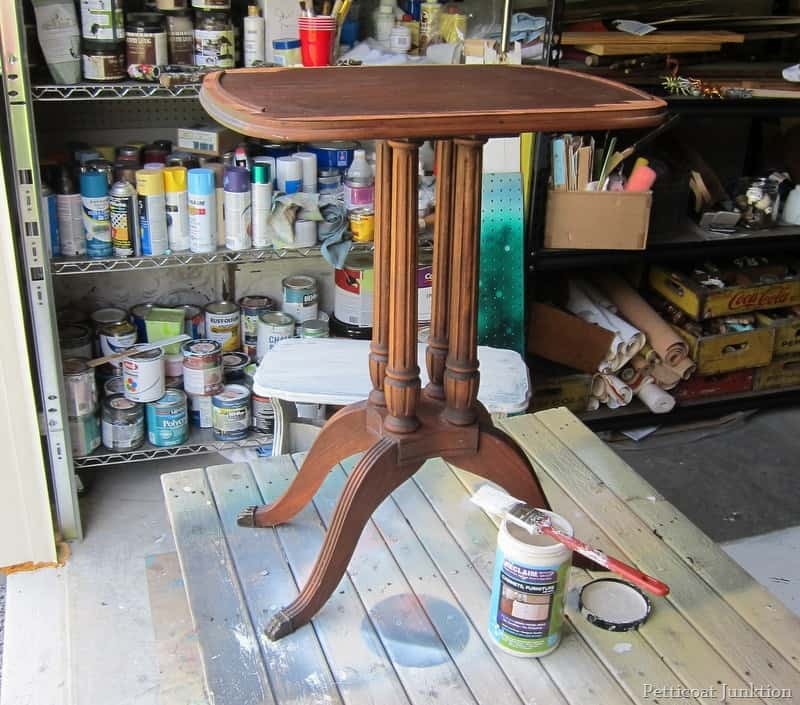 I dry-brushed the leg columns and thought that was a great look but then decided the table looked too choppy so I distressed the feet…..really heavily….so they would match the leg columns. For the heavy distressing on the feet I used an electric sander. So……what do you think? I have some old items, I’ll have to try some of your suggestions. I love the look and the photos you took. The contrast is what is great! I love the table. I normally like the dark finish on old furniture. This one is exceptional the white is perfect. Thanks Carolyn, I really do love this piece! That is gorgeous!! I love the super worn look. WHAT DO I THINK? WHAT DO I THINK? oops sorry to yell, but once again you have BLOWN ME AWAY!!! GORGEOUS! Absolutely love it! I think the uber-distressing is what makes this piece so awesome. Straight out of Jeanne d’Arc! Oh man that’s pretty! Perfect wear and distress. Perfect staging too (which is what caught my eye). 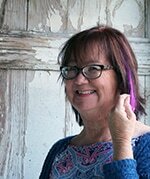 Stopped in from Miss Mustard Seeds Friday Linky Party! I love the off-white look! I would rub the base with dark wax so it would have the darker wood showing through like the spindles. 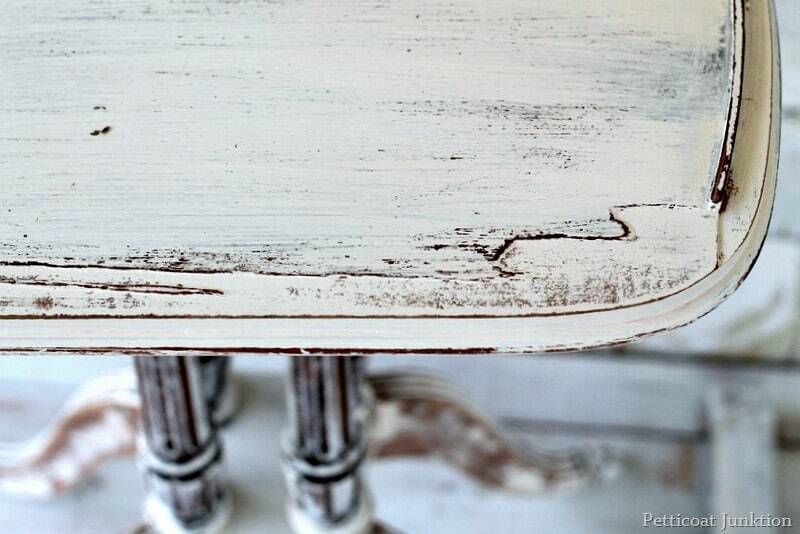 I really like how you paint your furniture, mine never has such a smooth finish as yours! Love it in white. Pinning for sure. 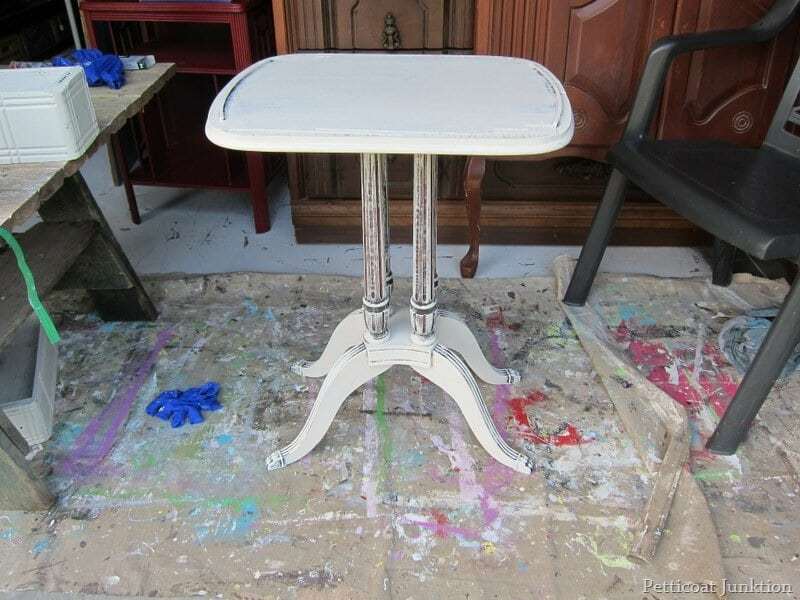 I love what you did, I think the distressing is perfect. I wish I could work up the nerve to do some of my tables. I have had them from 20 to 40 yrs, some I bought some are hand-me-downs, but all were antique when I got them and I’m just kind of tired of them. I love the white and think it would certainly brighten this place up a lot. Love it! 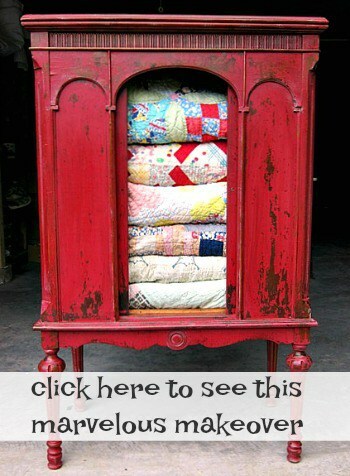 Your blog was my inspiration to start collecting and painting old furniture finds! 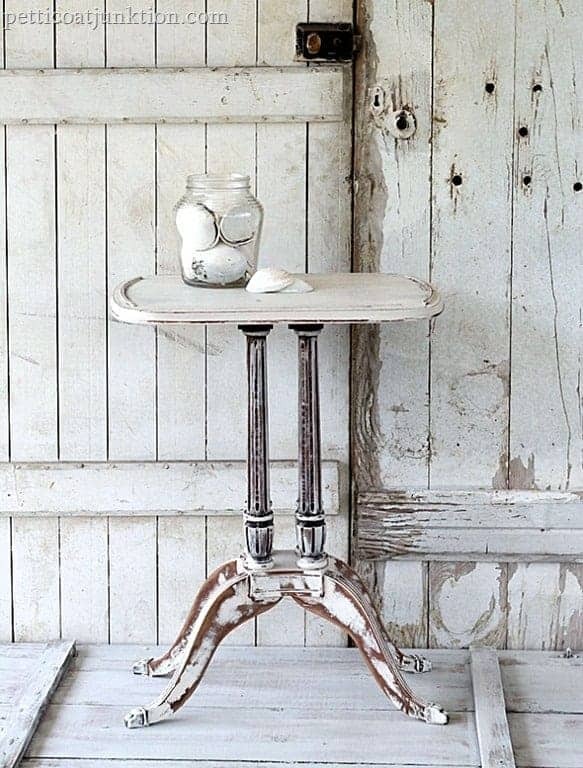 I love it, however, I think I would have not distressed the feet so much….but, this is my kind of table!…I love your little end tables, occasional tables and half tables and side tables! Especially in love with the metal paints, like silver! THOSE are my faves….!!! I really like the look!! What a cute table. Love the white distressed table. Especially how you graduated the distressing from teh top down. Very nicely done!